The International League Most Valuable Player Award (MVP) is an annual award given to the best player in minor league baseball's International League. Managers from the 14 International League teams vote for the winner of the award, which is then combined with 14 votes from various general managers, broadcasters, and media representatives around the league to determine a winner. 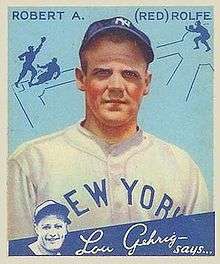 In 1932, Marv Owen won the first ever International League MVP Award. First basemen, with 21 winners, have won the most among infielders, followed by third basemen (16), shortstops (9), and second basemen (5). Five catchers have won the award. Twenty-nine outfielders have won the MVP Award, the most of any position. A total of 4 pitchers have won the MVP award. 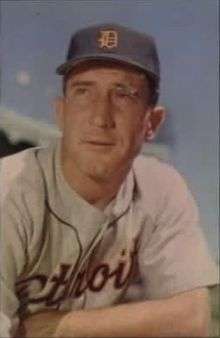 The last pitcher to win was Red Barrett in 1942. The International League League now has a Most Valuable Pitcher Award, which was established in 1953. Rocky Nelson has the record for most MVP Award wins with three (1953, 1955, and 1958). Roberto Petagine has won the MVP Award twice. 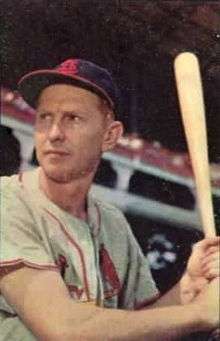 Two International League MVP Award winners, Red Schoendienst and Jim Rice, have gone on to be inducted in the National Baseball Hall of Fame and Museum. "International League Award Winners". International League. Minor League Baseball. Retrieved March 13, 2015. ↑ Wagner, James (March 12, 2015). 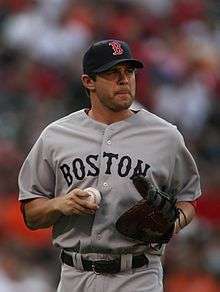 "Steven Souza Jr. Named International League MVP, Rookie of the Year". Nationals Journal. The Washington Post. Retrieved August 26, 2014. 1 2 "Baseball Hall of Fame Inductees". Baseball-Reference.com. Retrieved December 3, 2009. ↑ "Marv Owen Minor League Statistics and History". Baseball-Reference.com. Retrieved March 12, 2015. ↑ "Red Rolfe Minor League Statistics and History". Baseball-Reference.com. Retrieved March 12, 2015. ↑ "Ike Boone Minor League Statistics and History". Baseball-Reference.com. Retrieved March 12, 2015. ↑ "George Puccinelli Minor League Statistics and History". Baseball-Reference.com. Retrieved March 12, 2015. ↑ "Beauty McGowan Minor League Statistics and History". Baseball-Reference.com. Retrieved March 12, 2015. ↑ "Buck Crouse Minor League Statistics and History". Baseball-Reference.com. Retrieved March 12, 2015. ↑ "Oliver Carnegie Minor League Statistics and History". Baseball-Reference.com. Retrieved March 12, 2015. ↑ "Mickey Witek Minor League Statistics and History". Baseball-Reference.com. Retrieved March 12, 2015. ↑ "Mike Ryba Minor League Statistics and History". Baseball-Reference.com. Retrieved March 12, 2015. ↑ "Fred Hutchinson Minor League Statistics and History". Baseball-Reference.com. Retrieved March 12, 2015. ↑ "Red Barrett Minor League Statistics and History". Baseball-Reference.com. Retrieved March 12, 2015. ↑ "Red Schoendienst Minor League Statistics and History". Baseball-Reference.com. Retrieved March 12, 2015. ↑ "Howie Moss Minor League Statistics and History". Baseball-Reference.com. Retrieved March 12, 2015. ↑ "Sherm Lollar Minor League Statistics and History". Baseball-Reference.com. Retrieved March 12, 2015. ↑ "Eddie Robinson Minor League Statistics and History". Baseball-Reference.com. Retrieved March 12, 2015. ↑ "Hank Sauer Minor League Statistics and History". Baseball-Reference.com. Retrieved March 12, 2015. ↑ "Jimmy Bloodworth Minor League Statistics and History". Baseball-Reference.com. Retrieved March 12, 2015. ↑ "Bobby Morgan Minor League Statistics and History". Baseball-Reference.com. Retrieved March 12, 2015. ↑ "Tom Poholsky Minor League Statistics and History". Baseball-Reference.com. Retrieved March 12, 2015. ↑ "Archie Wilson Minor League Statistics and History". Baseball-Reference.com. Retrieved March 12, 2015. ↑ "Jim Gilliam Minor League Statistics and History". Baseball-Reference.com. Retrieved March 12, 2015. 1 2 3 "Rocky Nelson Minor League Statistics and History". Baseball-Reference.com. Retrieved March 12, 2015. ↑ "Elston Howard Minor League Statistics and History". Baseball-Reference.com. Retrieved March 12, 2015. 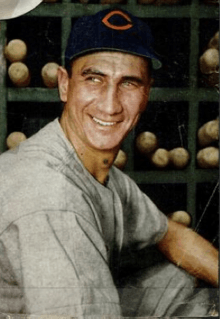 ↑ "Mike Goliat Minor League Statistics and History". Baseball-Reference.com. Retrieved March 12, 2015. ↑ "Mike Baxes Minor League Statistics and History". Baseball-Reference.com. Retrieved March 12, 2015. ↑ "Pancho Herrera Minor League Statistics and History". Baseball-Reference.com. Retrieved March 12, 2015. ↑ "Jim King Minor League Statistics and History". Baseball-Reference.com. Retrieved March 12, 2015. ↑ "Ted Savage Minor League Statistics and History". Baseball-Reference.com. Retrieved March 12, 2015. ↑ "Tony Martínez Minor League Statistics and History". Baseball-Reference.com. Retrieved March 12, 2015. ↑ "Don Buford Minor League Statistics and History". Baseball-Reference.com. Retrieved March 12, 2015. ↑ "Joe Morgan Minor League Statistics and History". Baseball-Reference.com. Retrieved March 12, 2015. ↑ "Joe Foy Minor League Statistics and History". Baseball-Reference.com. Retrieved March 12, 2015. ↑ "Mike Epstein Minor League Statistics and History". Baseball-Reference.com. Retrieved March 12, 2015. ↑ "Tommie Aaron Minor League Statistics and History". Baseball-Reference.com. Retrieved March 12, 2015. ↑ "Merv Rettenmund Minor League Statistics and History". Baseball-Reference.com. Retrieved March 12, 2015. ↑ "Luis Alvarado Minor League Statistics and History". Baseball-Reference.com. Retrieved March 12, 2015. ↑ "Roger Freed Minor League Statistics and History". Baseball-Reference.com. Retrieved March 12, 2015. ↑ "George Kopacz Minor League Statistics and History". Baseball-Reference.com. Retrieved March 12, 2015. ↑ "Bobby Grich Minor League Statistics and History". Baseball-Reference.com. Retrieved March 12, 2015. ↑ "Dwight Evans Minor League Statistics and History". Baseball-Reference.com. Retrieved March 12, 2015. ↑ "Jim Fuller Minor League Statistics and History". Baseball-Reference.com. Retrieved March 12, 2015. ↑ "Jim Rice Minor League Statistics and History". Baseball-Reference.com. Retrieved March 12, 2015. ↑ "Mike Vail Minor League Statistics and History". Baseball-Reference.com. Retrieved March 12, 2015. ↑ "Rich Dauer Minor League Statistics and History". Baseball-Reference.com. Retrieved March 12, 2015. ↑ "Mickey Klutts Minor League Statistics and History". Baseball-Reference.com. Retrieved March 12, 2015. ↑ "Joe Lis Minor League Statistics and History". Baseball-Reference.com. Retrieved March 12, 2015. ↑ "Ted Cox Minor League Statistics and History". Baseball-Reference.com. Retrieved March 12, 2015. ↑ "Gary Allenson Minor League Statistics and History". Baseball-Reference.com. Retrieved March 12, 2015. ↑ "Bobby Brown Minor League Statistics and History". Baseball-Reference.com. Retrieved March 12, 2015. ↑ *le003dav "Dave Stapleton Minor League Statistics and History". Baseball-Reference.com. Retrieved March 12, 2015. ↑ "Marshall Brant Minor League Statistics and History". Baseball-Reference.com. Retrieved March 12, 2015. ↑ "Brett Butler Minor League Statistics and History". Baseball-Reference.com. Retrieved March 12, 2015. ↑ "Tucker Ashford Minor League Statistics and History". Baseball-Reference.com. Retrieved March 12, 2015. ↑ "Tim Teufel Minor League Statistics and History". Baseball-Reference.com. Retrieved March 12, 2015. ↑ "Scott Bradley Minor League Statistics and History". Baseball-Reference.com. Retrieved March 12, 2015. ↑ "Dan Pasqua Minor League Statistics and History". Baseball-Reference.com. Retrieved March 12, 2015. ↑ "Pat Dodson Minor League Statistics and History". Baseball-Reference.com. Retrieved March 12, 2015. ↑ "Randy Milligan Minor League Statistics and History". Baseball-Reference.com. Retrieved March 12, 2015. ↑ "Craig Worthington Minor League Statistics and History". Baseball-Reference.com. Retrieved March 12, 2015. ↑ "Tom O'Malley Minor League Statistics and History". Baseball-Reference.com. Retrieved March 12, 2015. ↑ "Hensley Meulens Minor League Statistics and History". Baseball-Reference.com. Retrieved March 12, 2015. ↑ "Derek Bell Minor League Statistics and History". Baseball-Reference.com. Retrieved March 12, 2015. ↑ "J. T. Snow Minor League Statistics and History". Baseball-Reference.com. Retrieved March 12, 2015. ↑ "Jim Thome Minor League Statistics and History". Baseball-Reference.com. Retrieved March 12, 2015. ↑ "Jeff Manto Minor League Statistics and History". Baseball-Reference.com. Retrieved March 12, 2015. ↑ "Butch Huskey Minor League Statistics and History". Baseball-Reference.com. Retrieved March 12, 2015. ↑ "Phil Hiatt Minor League Statistics and History". Baseball-Reference.com. Retrieved March 12, 2015. 1 2 "Roberto Petagine Minor League Statistics and History". Baseball-Reference.com. Retrieved March 12, 2015. ↑ "Steve Cox Minor League Statistics and History". Baseball-Reference.com. Retrieved March 12, 2015. ↑ "Chad Mottola Minor League Statistics and History". Baseball-Reference.com. Retrieved March 12, 2015. ↑ "Toby Hall Minor League Statistics and History". Baseball-Reference.com. Retrieved March 12, 2015. ↑ "Raúl González Minor League Statistics and History". Baseball-Reference.com. Retrieved March 12, 2015. ↑ "Fernando Seguignol Minor League Statistics and History". Baseball-Reference.com. Retrieved March 12, 2015. ↑ "Jhonny Peralta Minor League Statistics and History". Baseball-Reference.com. Retrieved March 12, 2015. 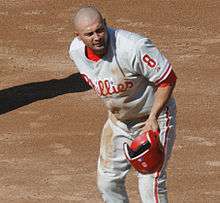 ↑ "Shane Victorino Minor League Statistics and History". Baseball-Reference.com. Retrieved March 12, 2015. ↑ "Kevin Witt Minor League Statistics and History". Baseball-Reference.com. Retrieved March 12, 2015. ↑ "Mike Hessman Minor League Statistics and History". Baseball-Reference.com. Retrieved March 12, 2015. ↑ "Jeff Bailey Minor League Statistics and History". Baseball-Reference.com. Retrieved March 12, 2015. ↑ "Shelley Duncan Minor League Statistics and History". Baseball-Reference.com. Retrieved March 12, 2015. ↑ "Dan Johnson Minor League Statistics and History". Baseball-Reference.com. Retrieved March 12, 2015. ↑ "Russ Canzler Minor League Statistics and History". Baseball-Reference.com. Retrieved March 12, 2015. ↑ "Mauro Gómez Minor League Statistics and History". Baseball-Reference.com. Retrieved March 12, 2015. ↑ "Chris Colabello Minor League Statistics and History". Baseball-Reference.com. Retrieved March 12, 2015. ↑ "Steven Souza Minor League Statistics and History". Baseball-Reference.com. Retrieved March 12, 2015. ↑ "Matt Hague Minor League Statistics and History". Baseball-Reference.com. Retrieved September 1, 2015. ↑ "Ben GamelMinor League Statistics and History". Baseball-Reference.com. Retrieved August 30, 2016.